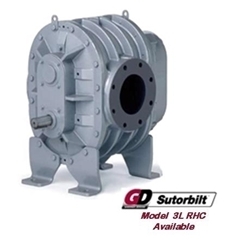 The Sutorbilt Positive Displacement Low Pressure Blower from Thomas Conveyor & Equipment is available in fourteen different models. Each displacement blower offers a variety of features which result in a reduced noise and a more stable, vibration-free pneumatic conveying operation. View all of our Sutorbilt Blowers below and contact us for more information.